When seeds are the same color has soil a grower can lose track of where they are. 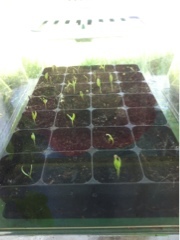 The proof appears as time passes, and the seedlings emerge. 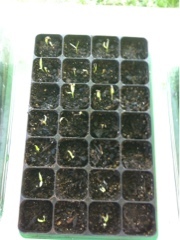 One entire length of spots for seeds has nothing sprouting. Not one thing. Leads this grower to believe that an interruption must have occurred while setting seeds in this flat. And that is why our phone number is usually not listed. Farmer=easily distracted! Also why we plant continuously!